When encountering an attacker or stalker, you can pull out the safety pin on the side of the angel wing keychain alarm, it will sounds an 90db alarm then to scare off the attackers, you only need to insert the safety pin back to stop it. Made of environmentally friendly material, free from vandalism and will not break. 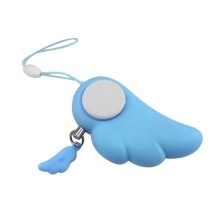 Keychain design, mini and lightweight, loud sound with energy-saving battery. Portable and inconspicuous and can not be easily identified as an alarm. Once open, will draw people&apos;s attention and scare off the attacker. You can use it as a decoration for handbags, purses to protect you. Suitable for children, elder and woman to be a self help device. The alarm can spread in a very wide area, you will get more chances for help.